ATV/UTV clamping tie-down system features engineered compositeconstructed clamps that easily lock in and out of low-profile mounting plates. The chock/clamps feature raised tire guides to properly align a vehicle, and adjustable tire bars to easily accept any size UTV or ATV tire. The SuperClamp includes a spot for a standard padlock to deter theft. $499, www.superclamp.net. Tie-downs used to just be tie-downs, but not anymore. The Lockstrap is the only tiedown that can offer peace of mind while you’re away from your truck or trailer. Lockstraps are 8.5-foot-long tie-downs that feature combolocking carabiners on both ends and a fulllength steel cable inside the strap. The locking carabiners not only keep your ATV or UTV from walking away, but you can also leave the tiedowns locked permanently in your bed or trailer without worry of someone stealing or borrowing them. 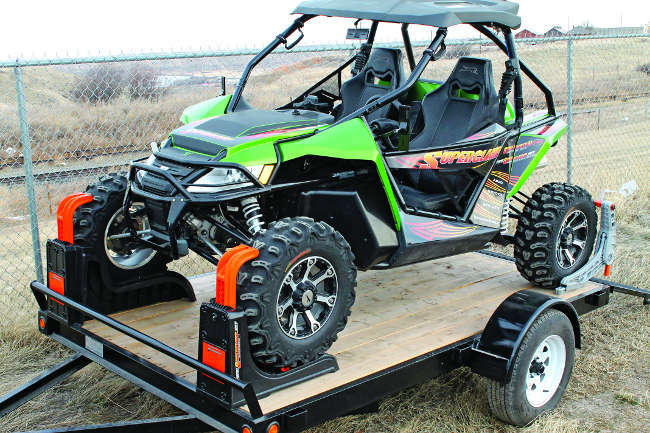 Lockstraps include a soft strap to keep locks away from damaging or scratching your ATV. Lockstraps can be used to lock just about anything, and they are surprisingly difficult to cut. Standard-issue bolt cutters can clip through a cable lock in mere seconds, but the nylon straps combined with a cable are amazingly difficult to get through. $45 individually, www.lockstraps.com or call (949) 702-5333. Bully dog Triple Dog GT Diesel Gauge/Tuner If you drive a diesel pickup, you want this. Regardless of how many ATVs are being hauled with your diesel, this engine tuner will extract more power and improve fuel economy on your truck. We have used one for two years and saw a big horsepower increase, as well as saved 2–3 miles per gallon—even more if you can keep your foot out of it! The Bully Dog programmer even features a built-in driving coach that, when followed, can show huge mpg gains. The Triple Dog GT also serves as a monitor for all engine and turbo functions, as well as serves as a diagnostic device/code reader. $699, www.bullydog.com. CONVERT YOUR ATV OR UTV INTO A SWAMP MACHINE!